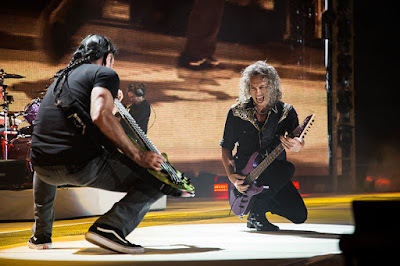 Metallica performed their 1991 classic, “Sad But True”, at the Alamodome in San Antonio, TX on June 14, and the band are sharing professional footage from the event. The group’s tenth studio album has achieved platinum status in the US for sales of 1 million copies, and was recently named Top Rock Album Of The Year at the 2017 Billboard Music Awards in Las Vegas, NV. The project took top prize ahead of fellow nominees Radiohead, The Red Hot Chili Peppers, The Lumineers and Twenty One Pilots. Following a June 18 appearance at Chicago’s Soldier Field, Metallica will enjoy a two-week break from the WorldWired tour before returning to action in Orlando, FL on July 5.